Update: Israel has concluded the soldier it believed to be captured by Hamas, Lt. Hadar Goldin, was killed in battle in Gaza on Friday. A special committee reviewed pathological evidence at the scene and other information and made the determination. Today 67 rockets fired from #Gaza hit #Israel. Overall, more than 650 rockets hit Israel in the last six days. Israel says Hamas is using Palestinians as human shields. (Video here and here. )They are prepared to move to ground attacks if the rocket attacks don't stop. Israel has called up 75,000 reservists and struck Hamas Government buildings. Hamas has claimed credit for firing rockets at Tel Aviv and Jerusalem. The Israeli military said some 150 rockets fired from Gaza had hit Israel since Friday and at least 83 more were intercepted by its Iron Dome anti-missile system. Gaza is a small place with a lot of people, and there have been at least 38 civilian casualties, some of them children. 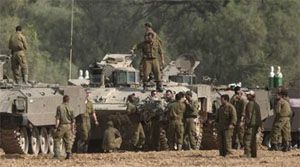 Israel says it is acting in self-defense, and the rockets Hamas is firing at them come from Gaza. President Elect Barack Obama's support for Israel grew during the course of the campaign. This weekend he received briefings from Bush's Secretary of State, Condoleeza Rice. In three weeks, he will be President and shortly thereafter, Hillary Clinton will be Secretary of State.